ALBUQUERQUE — With 54 seconds to go Friday night, UNLV’s 2017 bowl chances were on life support. Trailing 35-30, the Rebels were facing a 3rd-and-4 on their own 29 and had just one timeout remaining. And freshman quarterback Armani Rogers, making his first start since suffering a concussion on Oct. 21, had been struggling with his passing accuracy. 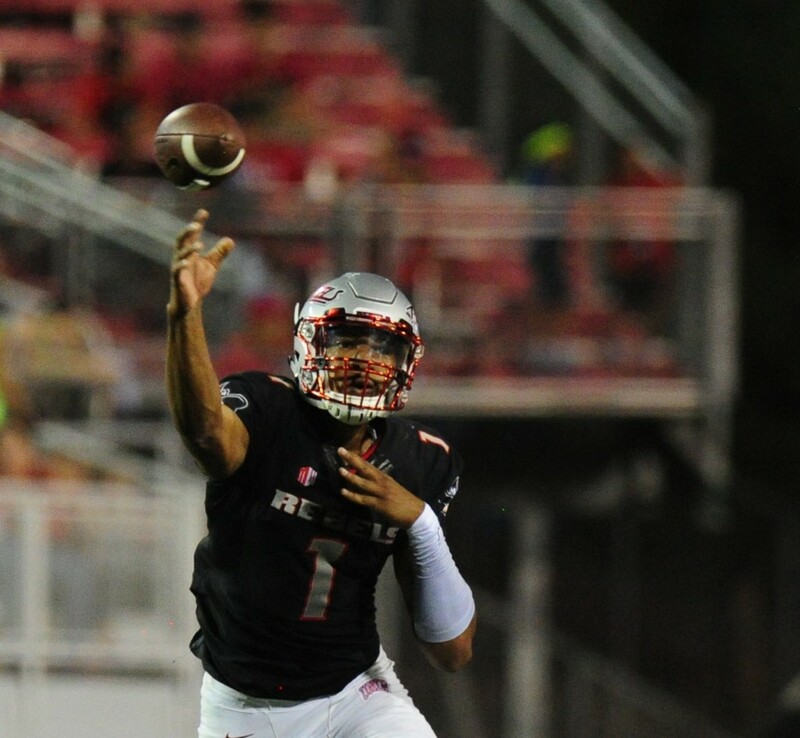 But Rogers responded with four straight completions – including a had-to-see-it-to-believe-it 50-yard laser to Brandon Woods followed by a 14-yard touchdown pass to Kendal Keys – and UNLV pulled out a dramatic 38-35 victory over New Mexico. The Rebels (5-6, 4-3 Mountain West), who won despite yielding 482 rushing yards to the Lobos (3-8, 1-5), need to defeat in-state rival Nevada in the annual Battle for the Fremont Cannon next Saturday at Mackay Stadium in Reno to finish the regular season with the required six victories needed for bowl eligibility. Rogers, who also had an 83-yard touchdown run, finished with 193 yards rushing, a school record for a quarterback, breaking the old mark of 165 set by current San Diego State assistant Hunkie Cooper in 1991 against Oregon State. Running back Lexington Thomas added 127 yards and two touchdowns on 18 carries, his 12th career 100-yard rushing game of his UNLV career.